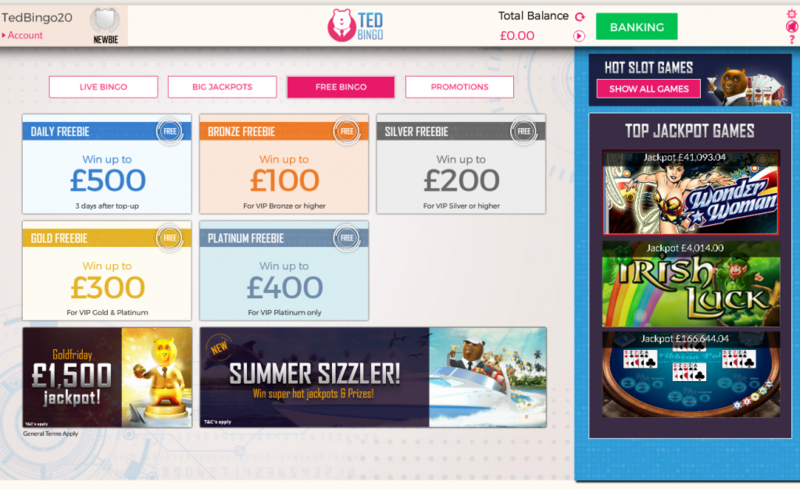 Ted Bingo Mobile | You Have a £40 Deposit Bonus Here! Launched in 2016, Ted Bingo is one of the latest Cassava bingo site to showcase an absolutely gigantic 200% first deposit bonus. Simply fund your account with £10 and you will receive a 200% bonus, plus you will also get £20 worth of tickets to the £777 jackpot game, giving you a total of £50 to play. It really doesn’t get any better than that! The site itself is run by the same company responsible for launching Moon Bingo and Robin Hood Bingo, so you can rest assured that they aren’t some kind of fly-by-night operation. The Ted Bingo mobile experience is one of the best around. There is no app to download, in fact, all you need to do is visit the official site at www.tedbingo.com from your smartphone or tablet and you will automatically be forwarded to a fully functional working version of the site. We are a supporter of responsive websites compared to apps. There is no fuss with downloading anything and you can rest assured that your phone won’t be infected with any kind of dodgy software. You can play slots from your standard game window too. Win FREE bingo jackpots of up to £500. Deposit £10, play £50 welcome bonus. Get up to £500 cashback every single week. Win a share of 10,000 free spins if you deposit £10 and don’t win. Play for bingo jackpots of up to £10,000. Fill up your progress bar and get a free spin of the wheel, where you can win up to £50 bonus cash. Ted Bingo offers a delightful mix of both 75 and 90 ball bingo. Prices start from as little as 1p, in fact, you will want to check out the Lucky Penny game where you can win up to £5000 from a 1p ticket. Other ticket prices range up to £2, plus there is also a decent choice of free bingo. Unlike a lot of other sites, you won’t find free games kicking off 24/7. 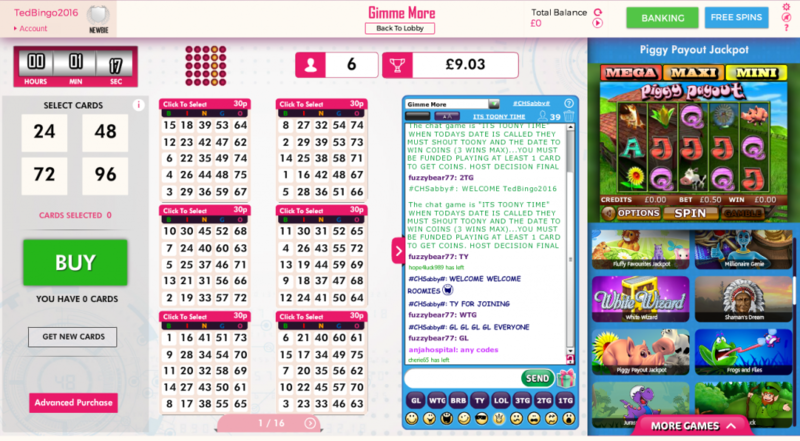 There are only a handful of free bingo games, however, the games that do take place have jackpots of between £50 and £500. Imagine winning that! Other worthwhile games that you should check out include the Daily Grand, which is a £1000 jackpot game with a £2 price tag. Also, it’s worth looking at the X Multiplier game where you can win up to £10,000 from just a 30p ticket every Saturday at 10 pm. Aside from bingo, you will find one of the best selection of slots around. The site benefits from Dragonfish software and as such, you will be able to play their complete suite of games. In total, there are over 100 different titles to choose from, including many popular known brands such as Fluffy Favourites, Starburst, Enchanted Prince and Cleopatra. If you like a cheeky punt, there is also a rather small, but good selection of casino games, including classics like Blackjack and Roulette. There are few reasons not to give Ted Bingo a whirl. Quite frankly, we are astonished at the amount of value that is offered to new players with their ginormous welcome package which is comprised of a 200% bingo bonus up to £40 and £20 worth of tickets to the £777 jackpot game. That said, despite offering some mighty cash freebies, the games don't let you down. There are plenty of guaranteed and progressive jackpots, a superb selection of slots and standard games are pretty fun too. If you have played at other Dragonfish/Cassava sites before you will know how the software works and how great it is. All things considered, this is definitely a bingo site that you will want to join. Not only is it fun to use, fully mobile compatible but you won't find a better deposit bonus around.